I really can't decide which way I love better in this crunchy sub roll or a layered mile high style eggplant parm...both are so good! Amazingly enough there are so many versions of how different we all make eggplant, breaded, floured, plain, broiled, baked, fried. I have done them every way and love them all. This one is pretty basic to us and simple. Grandma never measured anything so this is as close as I can get it. It's shook in flour, fried, and if they happened to make the baking dish without being totally being eaten first, then they become Parmesan. So here it goes I bring you our Roman way of Eggplant Parmesan, Grandma Victoria's version. This has Traditional Sunday Sauce and grated Romano, Parmesan blended cheeses layer with mozzarella. Heat oil in large fry pan. In a large plastic bag add flour and seasonings. Add eggplant slices to the egg mixture,(if you prefer a lighter coating moistened eggplant in plain water and shake in seasoned flour ) shake wet eggplant into the seasoned flour. Drop into hot frying oil about 1/2 inch of oil, fry each piece until golden brown. Spread out on paper towels to blot the oil. At this point you are ready to layer the eggplant. Eggplant, sauce, cheese, Parmesan cheese mozzarella, then repeat. If you prefer to bake these, bake on a sprayed cookie sheet, dot with olive oil on each slice of eggplant at 425 degrees until golden brown. For an eggplant sub, I cut thin slices of eggplant and fry till golden. Toast a sub roll butter on both sides and sprinkled with garlic powder. Top with favorite sauce, mozzarella, wrap in foil and bake until cheese is melted. Yum! Sounds just excellent, I need to make this very soon! Poppa Trix would go NUTS for this, he is always lamenting the lack of a good eggplant parm outside of New York. SO I will bookmark this and give him this special treat one of these days! 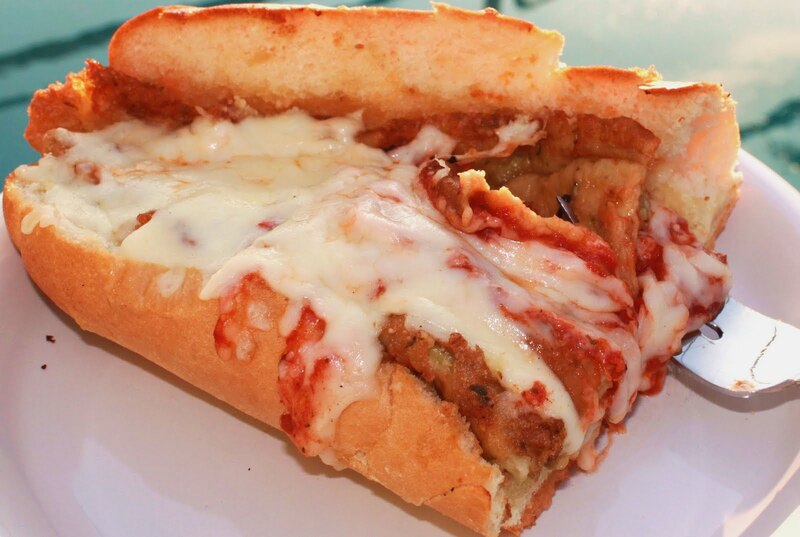 I love eggplant parm and I love the sandwich! My son Chris and I share one from Little Italy every time we go there! The sandwich reminds me of a panini I had in Italy. It had eggplant, portabella mushrooms, mozzarella and prosciutto. Bought it at the campo de fiori, one of my favorite places in Rome. My husband would go nuts over this recipe. His mother is Italian and makes very good eggplant parmesan. I have yet to make it myself though. One day I'll surprise my husband. Thank you (and Grandma Victoria) for this amazing looking recipe. What a sandwich! I'd definitely take the sub - GORGEOUS!!! This is a new way of cooking eggplant. It looks very delicious. Would love to try some day. wow, two great versions for eggplant - that sauce is just something else ... and when you mentioned slicing them so thin and frying, I immediately thought of eggplant chips, but I don't think they would ever get really crisp...do you think if you salted them to leach out the water, would that work? Very creative and sounds excellent! I think that's what I would eat if I had a huge hunger, perfect comfort food! Great recipe Claudia, and you know what I think about Grandma's recipes, they're the best! sounds so delicious ,claudia!and looks amazing! Excellent recipe. I love it. I bought two small eggplants which I intended for something else but now I have a feeling the plan has changed. I don't use eggplant as often as I should. I'll give this a try. It looks absolutely mouthwatering! This looks yummy delicious. I haven't made eggplant in a while. Was getting tired of it. This has made me ready to get back to it. I am so glad you posted this. Thanks. I really get need to buy some eggplant, this looks so delish. I haven't had eggplant for quite some time. I love eggplant parm too - any way it's prepared but my most favorite is when it's fried. I never had it on a hoagie like this - looks delish! I love eggplant and this looks so yummy. You were very lucky to have such a talented grandmother.... her cooking talents live on through you. Thanks of sharing them with us. Always had it fried - and now I bake them. Never put them on bread -will need to rectify that!